I bet a farmer would give you a funny look if you blurted that statement out. A geologist might do the same and a builder would definitely give you an argument as well. Well, surprise, surprise; so would a developer. All four of themwould disagree with that statement and all four for totally different reasons, that I hope, at least for the first three, you can work out the reasons. When a real estate developer looks at land, I suppose he/she's a bit like the farmer. The developer wants to know how many houses or apartments can be 'grown' on the land or how many 'Lots' can be subdivided from a large block of land. So a developer is very interested in the Zoning of the land. The zoning of land is your area is determined by the Local Authority, sometimes referred to a City Hall or the City Council. Zoning of land is determined by our elected Civic Leaders, under the guidance of Professional Town Planners, when the Town or City Plan is created.
. Where commercial office and business premises will be and so on into shopping centers and the like. In each zoning category separate rules apply. For example in a 'house' residential area, there might be a minimum lot size on which only one house can be built. The house to be constructed on that lot will have regulations that ensure that it will be "set-back" from the front and side boundaries by so many feet or metres. It may also limit how high the roof of the house can be, so as to limit structures dominating the street landscape. Let's just consider one of the zones mentioned above; Residential. However, we also have a zoning called 'LMR - or Low Medium Residential' and this zone allows a 'higher density' of livable units or condos or apartments, whatever they are called in your neck of the woods. As people get older and don't want the upkeep of a large family home, they may move into LMR style living. Or single people/ childless couples are also attracted to this type of accommodation. We then have a zone for high rise residential tower development, as well as retirement living. All of these zones have an impact on the land value, because all of them have, not only a different 'usage' but importantly to a developer they have a different capacity. Example: A residential house lot has the capacity to build only one house. An LMR zone has a formula usually, that when applied to the land area, determined how many condos, apartments, units, whatever, can be build on the land. Let’s say 6 can be built. Can you see, generally speaking, how the value of the house land will be less than the LMR land. Following on from that, the high rise land with a capacity of 100 units will be very much more expensive. 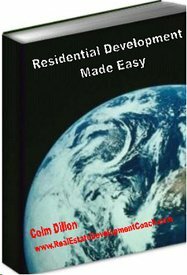 So if you intend becoming a developer, apart from studying, "Residential Development Made Easy," you should visit your local Town Plan and study the zoning rules that apply to your area of interest.